A PIC can't source more than 25mA, so how do I turn on/off a light bulb? With a relay! 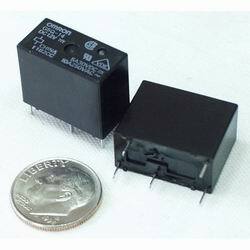 Relays are those large black boxes that go 'click'. There is a coil inside. When current flows through the coil a magnetic field causes the the internal paddle to move postions. This paddle usually carrys large currents or large voltages. Most relays have various ratings. We'll start with the coil voltage. '12VDC' for example means that the control coil requires 12V DC for the unit to switch the paddle. The other rating you'll see is '10A'. This refers to the amount of current you can run through the control paddle contact (not the current through the coil). So a 10A relay can handle a load of up to 10A- less than 10A is no problem. What happens if you try to run more current than the max? Well, it will probably work, but at higher currents the internal sparking will tend to burn the contacts. The paddle can potentially spot-weld itself to the contacts in extreme cases. There are sealed and vented relays. Vented relays tend to run a bit cooler, but are more suceptible to gunk getting into the moving parts. There are many configurations based on the circuit you need to control. DPDT (double pull double throw), SPDT (single pull double throw) are two of the most common. View the equivalent circuits in the mfg's datasheets to get an idea of how they work. Many microcontrollers cannot source enough current to feed the control coil. So Q1 is any old BJT (2N3904 is a good one) to turn on/off the relay. The diode 1N4148 (simple, cheap, can handle ~200mA current) is there to supress any fly-back current from entering the main power supply. Be sure to watch how you polarize your diode. There are various footprints available. Always be sure to do a 1:1 printout of your board and matchup the physical relay to the printout before PCB fab. Sometime the manufacturers list recommended footprints from the bottom view which can lead to mirrored and incorrect FPs.